The SARD-SC Project Steering Committee members met in IITA, Ibadan, recently to review progress of the project implementation and advise on changes on strategic orientation. 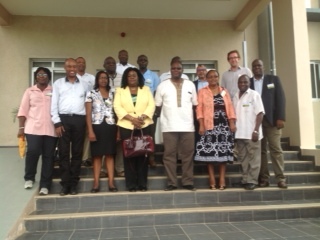 In attendance at the meeting were the Project Coordinator, Commodity Specialists, and a representative of IFPRI. The 11-member PSC meeting—chaired by Dr Yemi Akinbamijo, Executive Director of FARA—took place 30-31 March. While welcoming other members of the committee and SARD-SC project Commodity Specialists led by Project Coordinator Chrys Akem, Akinbamijo said he appreciated the SARD-SC project for its scientific thrust and potential to be a part of the “Feeding Africa” agenda, the new initiative of the African Development Bank (AfBD) to transform African agriculture. He also stated that with the project current expenditure at over 80%, the deliverables and the outcomes and impact should be made manifest to the farmers. Akinbamijo advised that the project should find a way of integrating the subregional organizational institutions and ensure proper documentation of the innovation platforms and their members. “At this stage of the project, off–takers of the developed technologies, processed products, and varieties ought to have been identified as well as the beneficiaries,” he said. Akinbamijo reiterated the importance of the SARD-SC project to be part of the Abuja 2006 agenda. Akem started with a summary of project achievements, which include among others: Effective engagement of stakeholders which led to the establishment of functional IPs for the four value chains, private sector operators including financial institutions, policy at local and national levels; Empowerment of youth and women skill development and entrepreneurship; Enhanced availability of productive and income-generating technologies, Capacity development of key stakeholders along different value chains, infrastructure and equipment development, among others. In attendance at the meeting were Commodity Specialists Marie Yomeni (Cassava), Sam Ajala, (Maize), Sidi Sanyang (Rice), Solomon Assefa (Wheat). Each of the SARD-SC project Commodity Specialists presented on the achievements for each commodity. Every presentation was critically analyzed by the PSC members, followed by valuable suggestions on how to ensure the project would have more impact on target beneficiaries. Tanguy Bernard of IFPRI also made a presentation on policy /market updates. For good documentation of the achievements, the committee advised the need to qunatify each achievement. “Linkage with CORAF must be demonstrated. There is need to tap into the CORAF network to broaden the project outcomes. One way to push the linkage will be to get the list of all beneficiaries fit into the SRO data template. There is need for a two-day innovation fair that will bring together SROs, banks, the private sector, government as well as policymakers to demonstrate what has been achieved by the project. This will enable the SROs to buy into what has been achieved in their respective countries,” Akinbamijo advised. Deputy Director General Kenton Dashiell (Partnerships and Capacity Development), thanked the chairman for his advice to improve the project implementation. He encouraged all the participants to continue putting more effort into their work “untill we see this project yielding more projects.” The next meeting will be hosted by ICARDA in November 2016. IITA-Mozambique is home at last!